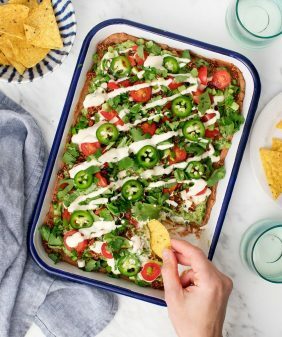 Veggie quesadillas are one of my go-to weeknight dinners, and I love this kale & quinoa version. Don't skip the tomatillo salsa for dipping! 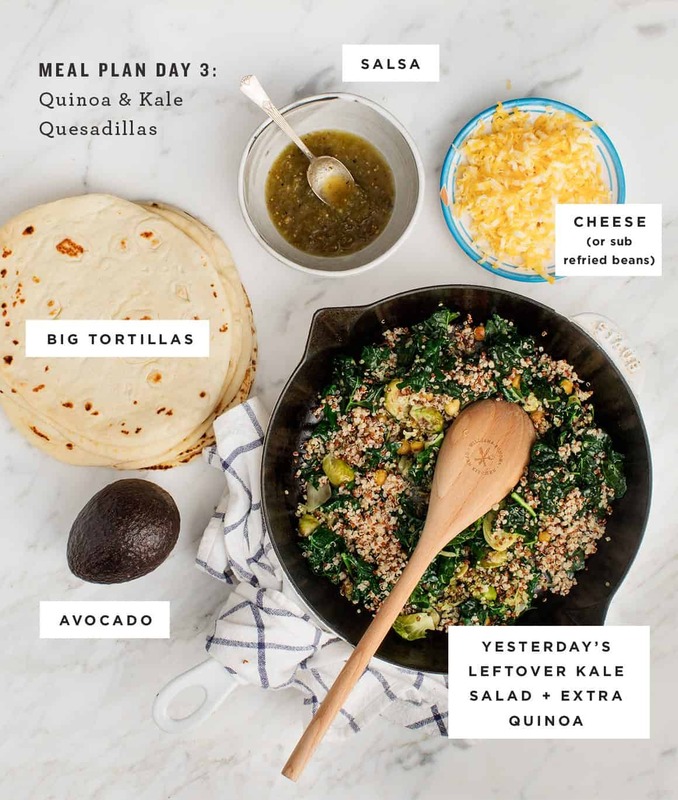 Aaaand meal planning week continues on Day 3 with these Quinoa Kale Veggie Quesadillas. Just to recap, I’m trying something new this week where I’m posting easy real-life meals in the order that we actually eat them. What does this mean? 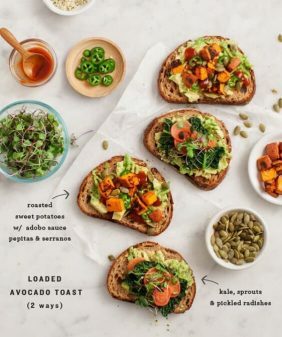 I went to the grocery store at the beginning of the week, I prepped a few components while making dinner on day 1, and I’ve been using those components and leftovers from the prior meal to make a different meal each day. One meal leads into the next, which makes cook/prep time a breeze. These meals are not culinary rocket science, but thinking like this helps me stay sane (and fed) every day – maybe it’ll help some of you too! On day 1: I started with these Mean Green Grain Bowls. This day involved the most prep – I roasted veggies, made quinoa, and assembled the grain bowls. 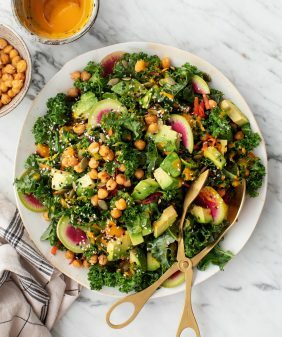 On day 2: I took a small bit of leftovers from the grain bowls, massaged a bunch of kale, and made those leftovers stretch into a Big Green Kale Salad. For day 3 (today! ): Starting with some of the leftovers from day 2’s kale salad, I lightly wilted the kale in a skillet with some quinoa (left over from day 1) and stuffed it between flour tortillas with cheese to make healthier-than-normal veggie quesadillas. If you’re vegan, skip the cheese and spread a layer of refried beans onto the tortilla to act as the glue. 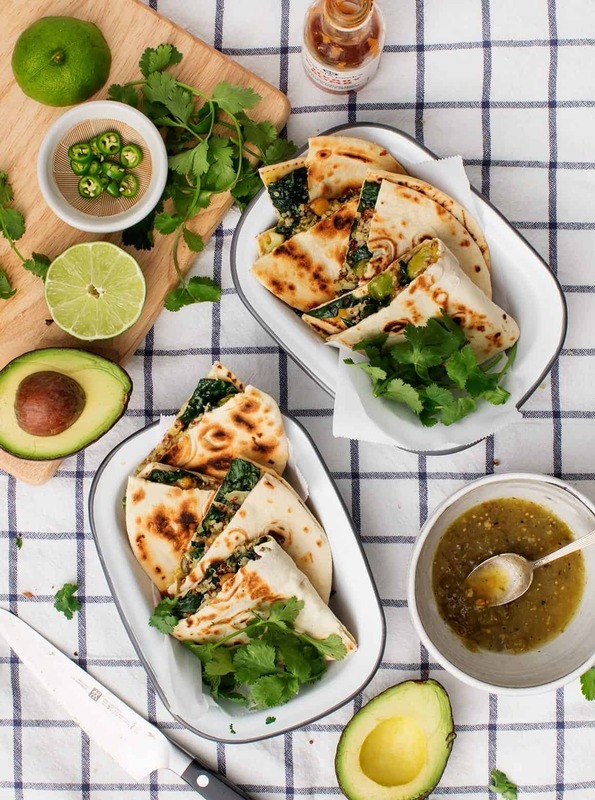 Serve these veggie quesadillas with lots of tomatillo salsa for dipping. Not pictured: I like to mash a little avocado with lime juice and a pinch of salt and slather that on my finished quesadillas. I think these look SO cute as individual servings in these Falcon Enamelware Pie Dishes. While the dishes got me in a picnic type of mood, it was snowing the night we ate these, so I discovered that they also make great TV trays. 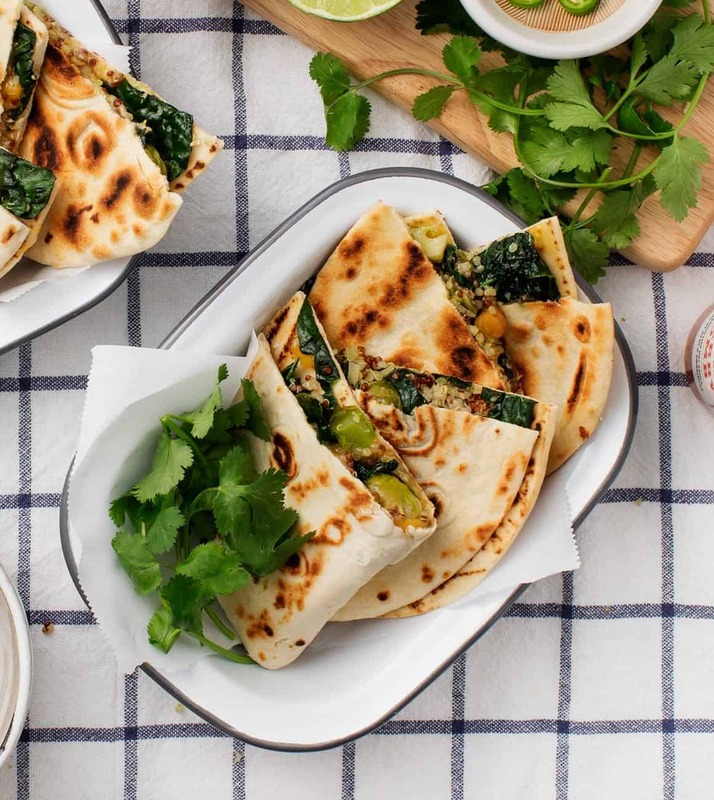 These healthy veggie quesadillas are packed with roasted veggies, kale, and quinoa. They're a fun, fast weeknight dinner! Heat a medium skillet to medium-low and brush with olive oil. Add the leftover kale salad, the additional cooked quinoa and toss, lightly heating, just until the kale wilts, about 2 minutes. Remove from the heat and stir in a scoop of salsa. Season to taste. 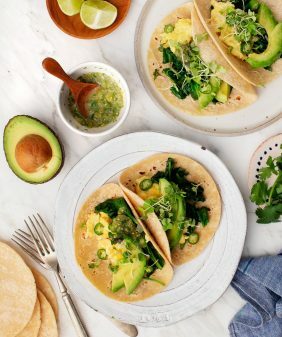 Assemble the tortillas with the shredded cheese and the kale/quinoa mixture. Wipe out the pan, and heat it to medium, with a drizzle of olive oil. Fold each filled tortilla in half and place each into the pan (you may have to work in batches). Heat the quesadillas about 2 minutes per side or until nicely charred. I like to put a loose cover on so that the steam helps the cheese melt. Repeat with all quesadillas. Serve with the remaining salsa, the avocado, lime wedges, peppers or hot sauce, and cilantro, as desired. 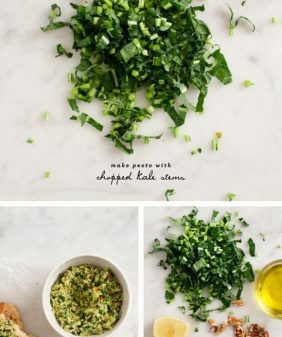 If you don't have leftover kale salad, you can use fresh, torn kale pieces. (about 2 cups). 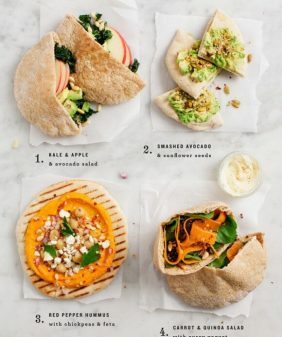 *Make these vegan by slathering the tortillas with a layer of refried beans instead (to act as the glue) instead of the cheese. Love them!!! 100% Mexican cook approved! nice tweaks to the traditional quesadilla recipe, nice punch of extra nutrients, thank you for this recipe!